POWL_QUERYR: To find the Query ID, Tab sequence number etc. 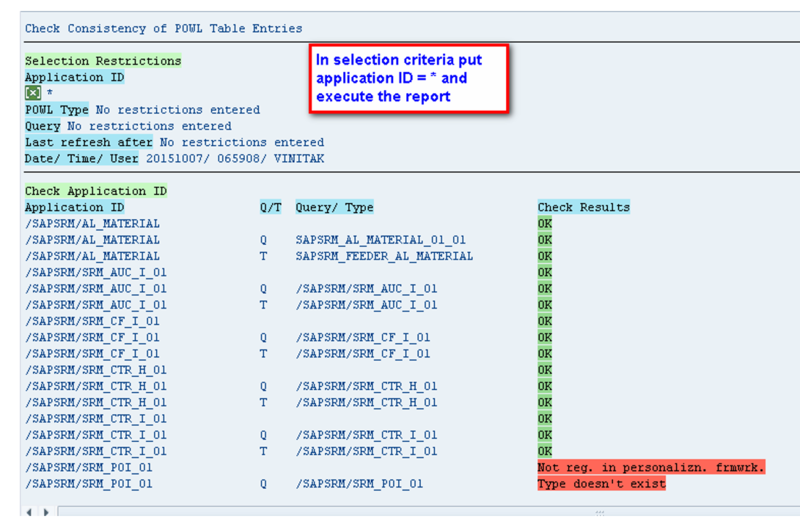 Some of the important SRM reports are as below which you can run via SE38 transaction. POWL_D02: Shows the Active POWL queries in the system. POWL_D05: Deletes the result if any left from the last run of POWL_D03 report. POWL_D06: Activate derived queries when you created some queries and link of POWL_QUERY to POWL_QUERYR is missing and needs to be activated for derived queries. POWL_D07: Same as POWL_D01 Shadowing entries to be deleted in case of multiple users. POWL_D08: When any layout changes occur in Development the report requires execution and result are stored in a workbench transport. POWL_D09: Default mapping of default layouts in queries or make any changes to the system.